The big countdown, 5 days left for the premiere of the new RS! 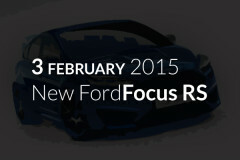 All fans of the Ford Focus are waiting for this event. February 3, 2015 will be officially revealed details of the third generation of the most powerful version of the model. We all can not wait to see it in reality. The next week belongs to the new Ford Focus RS. Join us and be up to date!